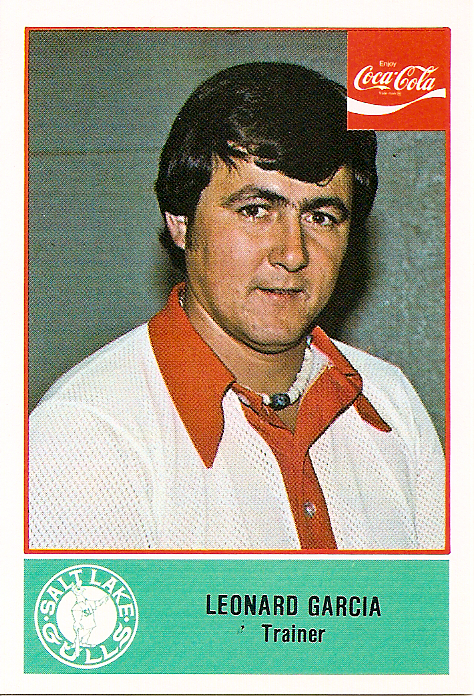 Washington-based Cramer Sports Productions--the future Pacific Cards--published this Salt Lake City set, a well-composed effort that stands out against its black-and-white minor league equivalents (e.g., 1977 TCMA Spartanburg Phillies). Coca-Cola added their sponsorship logo to the front and possibly underwrote its use of full-color. Morman legend credits sea gulls with miraculously saving Salt Lake area crops during a 19th-century insect plague (the Miracle of the gulls), precursor to their becoming both Utah's state bird and this team nickname from 1975 to 1984. As AAA affiliates for the Mariners and Angels, its best-known alums, including Ken Landreaux, Harold Reynolds, and Danny Tartabull, started with those franchises. 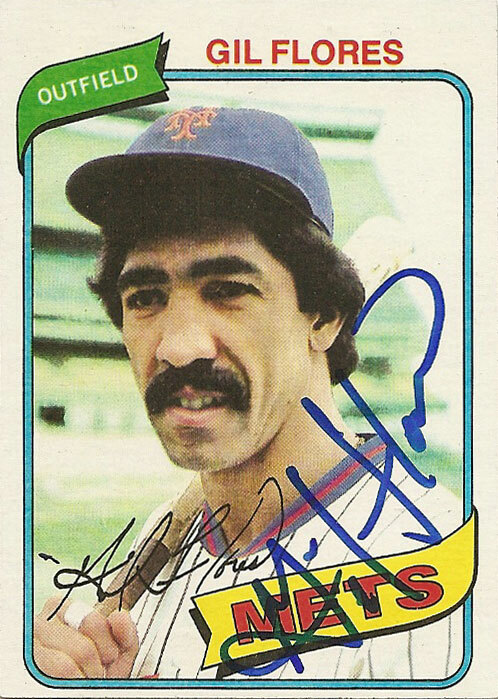 Gil went on to play for the Angels and Mets, adding some big-league pizzazz to his upper lip along the way. Saucy! 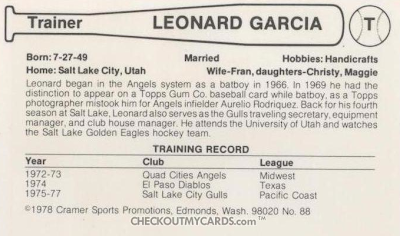 This SLC Gulls set means something extra to vintage card collectors because it includes team trainer Leonard Garcia. If that name doesn't sound familiar, how about 1969 Topps "Aurelio Rodriguez?" 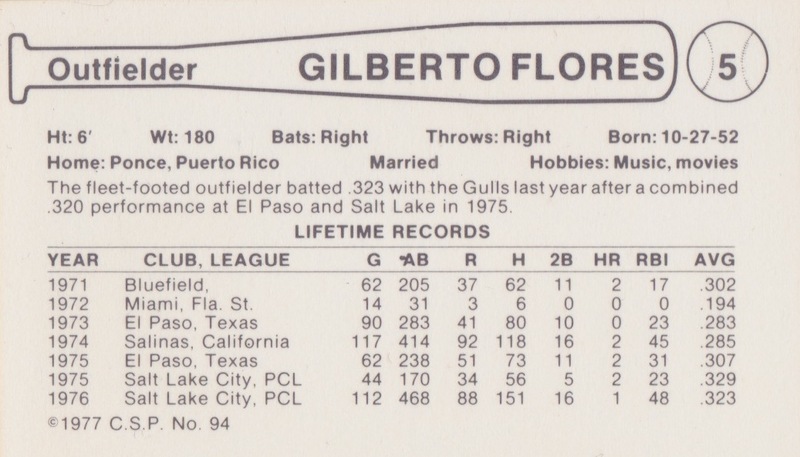 Thanks to photo-collecting complications, this card shows a correct name, but the picture's really California bat boy Leonard Garcia. Keith Olbermann wrote this about the labor circumstances surrounding 1969 Topps #653, full story at his blog. 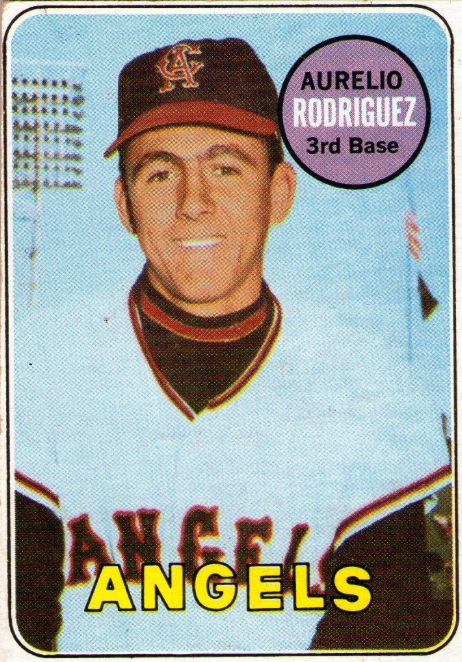 This is the 1969 card of the “original” A-Rod, the late brilliant defensive third baseman, Aurelio Rodriguez. It’s a great photo, but it’s not Aurelio Rodriguez. It’s Leonard Garcia, a rather mature-looking Angels’ batboy from 1968. Thus, guys who changed teams in ’68 or the ’68-69 off-season are shown hatless in old photographs in the first few series of the 1969 set. But 1968′s rookies for whom Topps had no photo? It had to get them in the minor leagues (the Topps files were filled with photos of nearly every Triple-A player in 1968), or buy shots from outside suppliers. At least a dozen images in the ’69 set, including Reggie Jackson and Earl Weaver – and “Aurelio Rodriguez” – were purchased from the files of the famous Chicago photographer George Brace. Somebody at Topps should’ve known, but the original Rodriguez/Garcia goof appears to have been Brace’s. 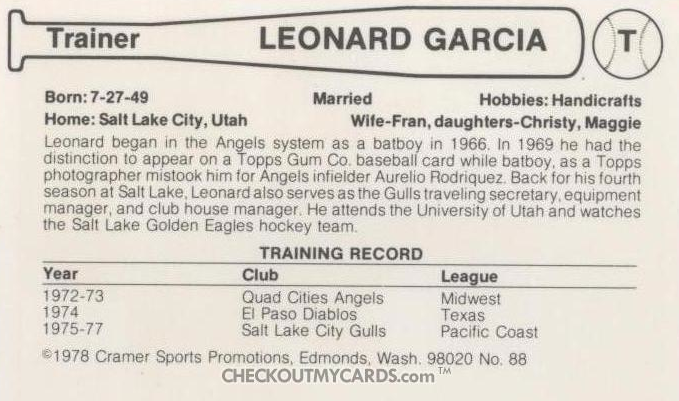 The grown-up Leonard Garcia actually received multiple Salt Lake City cards. 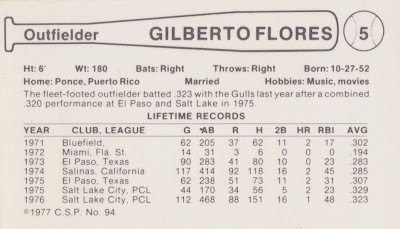 Here's his 1977 version, this set's only unnumbered card. 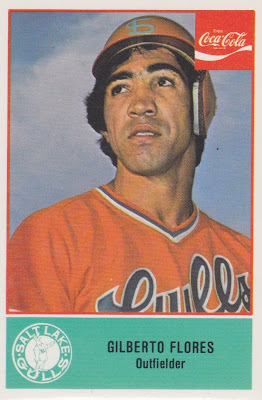 Garcia's 1978 card back refers, as Keith mentioned, to the 1969 Topps "Aurelio Rodriguez" snafu. Online checklists for 1977 Cramer show gaps at #3 and #23, which might be players pulled after they moved on to other teams. Value: This #5 cost $2.50 at MinorLeagueSingles.com and others in the set would be the same, unless they're special fans of guys who made the majors (bolded on the checklist). 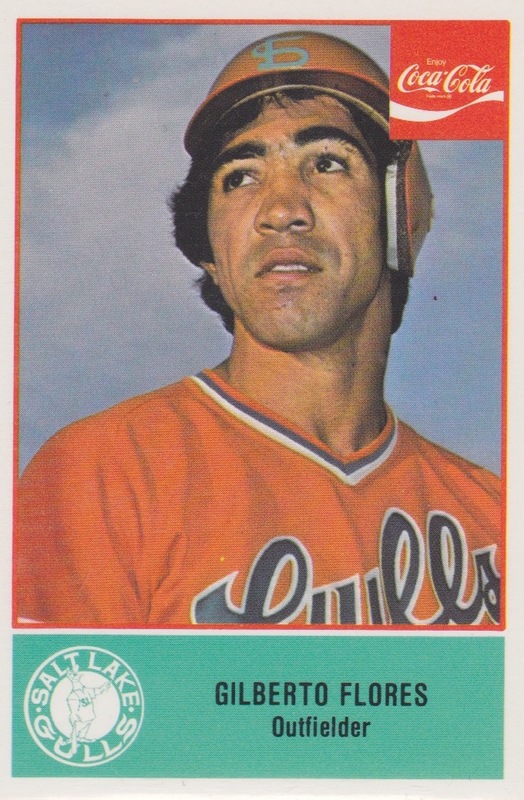 As far as I know, Garcia's card is a collector curiosity with no value premium.